The calendar says it’s the first day of spring and we’re over here in Minnesota lol’ing. It “snowed” all day today, but none of the snow stuck to the already snow-covered ground because it was just slightly above freezing. Although, I will say that the amount of snow on the ground has reduced this past week, and as some of the ground underneath is exposed, there is greenery in sight! How greenery can survive under a couple feet of snow is beyond me, but I am so thankful it can. So, to help spring get here sooner I have been working on some very “springy” recipes. 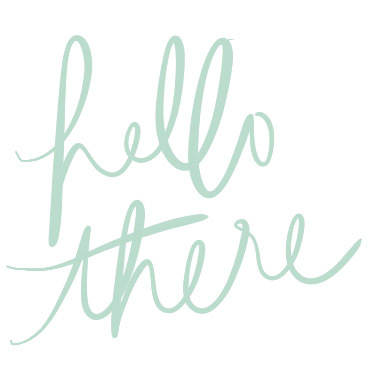 And what better of a recipe than one that includes a pastel pink color! 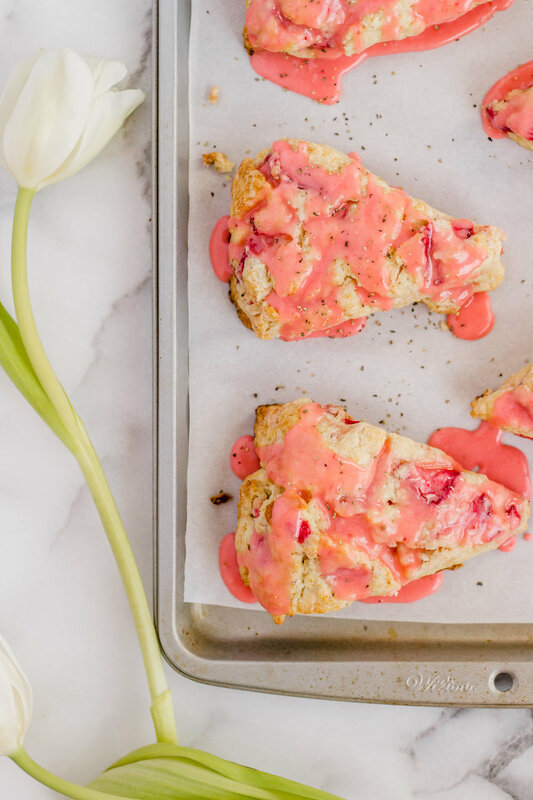 These strawberry black pepper scones were inspired by some of my favorite scones at Sally Loo’s Café in San Luis Obispo, CA. The flavor combination seems odd, but trust me, it WORKS! 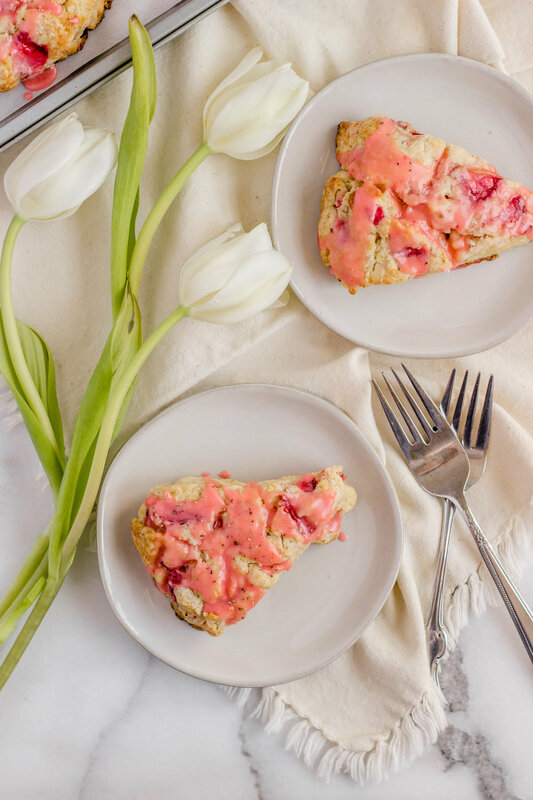 The fresh strawberries in the scones provide just the right amount of sweetness, which is perfectly balanced by the savory pepper taste. 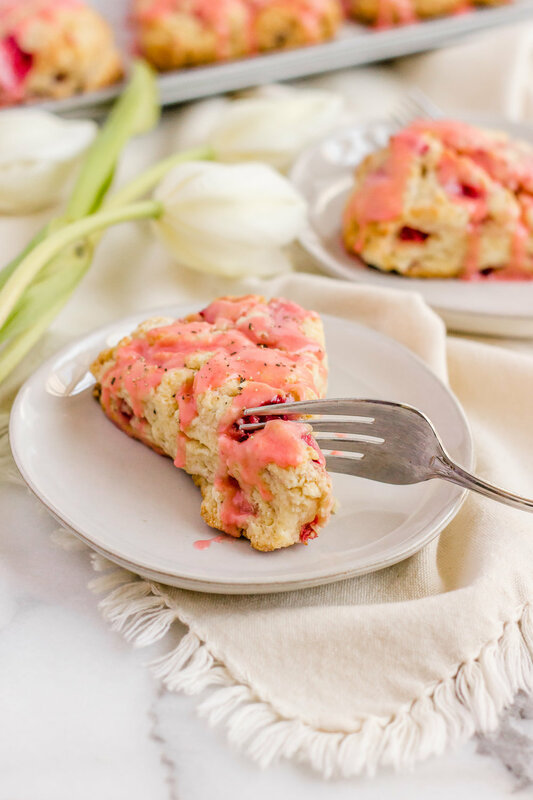 To top it all off, the strawberry glaze is so light and airy, and provides a beautiful pop of color! If you have never made scones before, don’t be intimidated like I was. 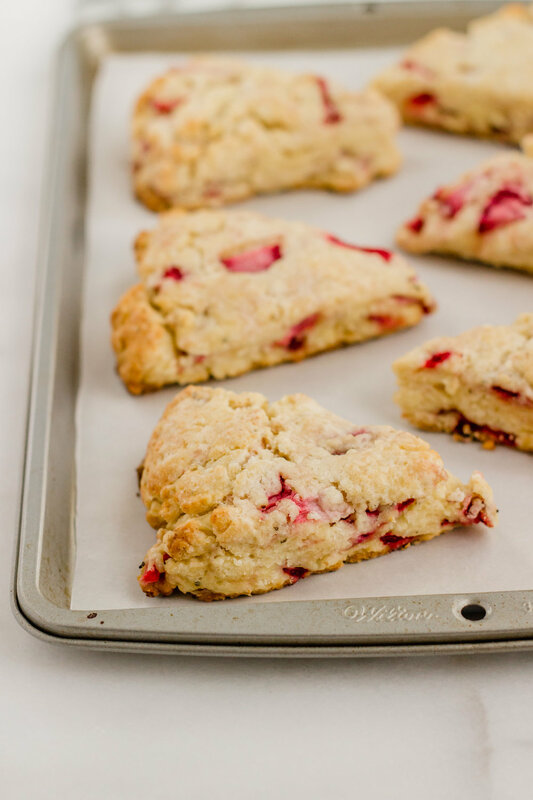 Be sure to read through the entire recipe before starting and check out the hints to help create the PERFECT scones! Preheat oven to 450F. Line baking sheet with parchment paper, set aside. Sift together the flour, sugar, baking powder, pepper, and salt into a large bowl. Grate the frozen butter into a small bowl, then return to the freezer. 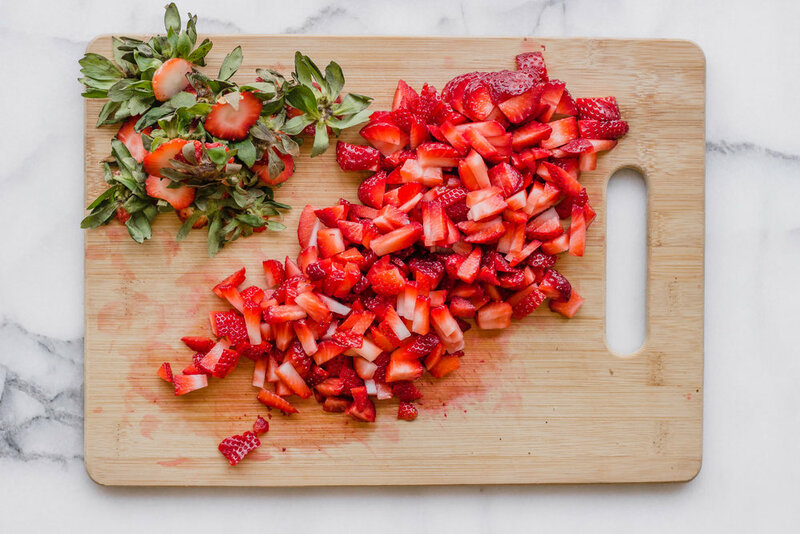 Prep the strawberries by washing them, drying completely, removing the stems, and cutting into small pieces. In a small bowl, combine the egg, 1 teaspoon vanilla, and 1/2 cup heavy cream. Set the wet ingredients aside. Cut the frozen, grated butter into the dry ingredients until it resembles coarse meal. Add 1 cup of the strawberries. With a few swift strokes, quickly combine. DO NOT overmix! Place the bowl in the freezer for 15 minutes. Transfer the dough to a lightly floured surface. Form the dough into a ball, with 1" thickness. Cut into 8 pieces. Place the pieces 1 1/2" apart in a circle on the pre-lined baking sheet. Brush the scones with heavy cream. Bake for 15 minutes until golden brown. Transfer to a cooling rack. In the meantime make the glaze. Mash the remaining strawberries through a strainer into a small bowl. Transfer 2 Tablespoons of the strawberry juice to another small bowl. Mix in the powdered sugar, 1/2 teaspoon heavy cream, 1/4 teaspoon vanilla. Top the scones with the glaze. Spinkle pepper on top. 1. Use FROZEN butter. As the scones bakes in the oven, the butter melts, releasing steam, creating little pockets of air. 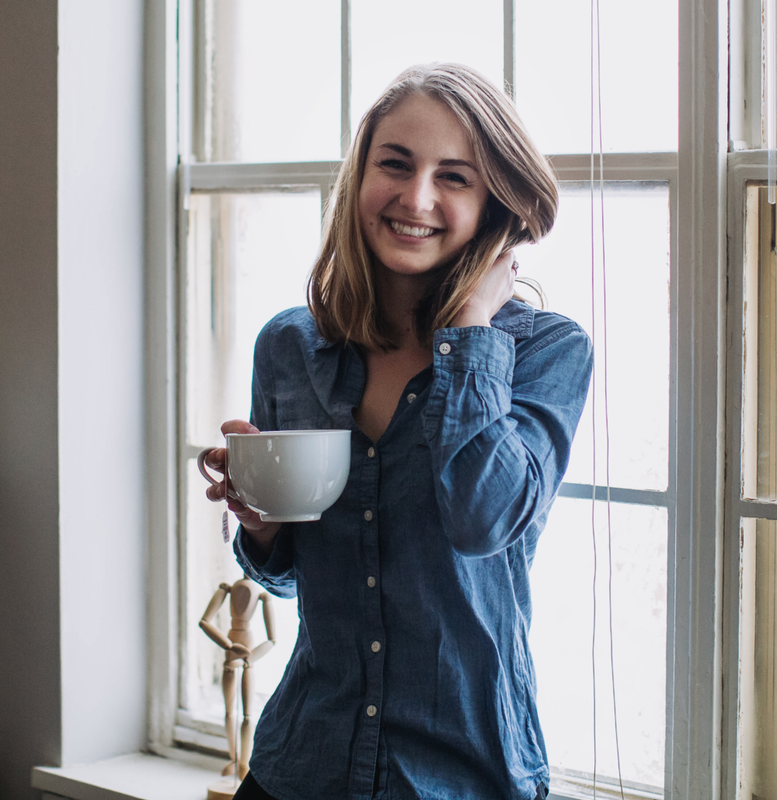 This lends itself to a soft and fluffy inside, while the outside will get crisp. 2. Therefore, DO NOT touch the dough more than needed. The heat from your hands will cause the butter to melt. The flour will then absorb the butter, rather than allowing those perfect little frozen butter pockets to exist in the dough.